Raelee Chapman talks to Steve Castley, of the Ubud Writers Group. 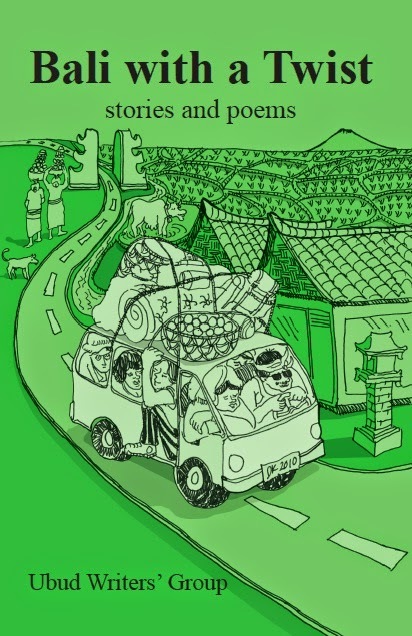 Steve has self-published two books, Through My Eyes: Adventures in Bali, in 2010 and A taste of Bali: stories and poems, in collaboration with Julie Silvester, in 2011. He is currently working on a gay romance called Nothing is Forever, and also a memoir called Stuffy's Story: 3 Mums, 6 Years. How long has your writers group been running? When and why was it formed? The Ubud Writers Group was founded on the 16th September 2008 and has grown in strength ever since. Our group has been operating for nearly 8 years now and for me it is a highlight of my fortnight. I know this is also true for the other members. In the fledgling years, we were hobby writers, scared to share our writing, fearful of having our egos bruised. But our group was set up to encourage writing and writers and our members have never lost sight of that goal. We trust each other and are sensitive to the way we give feedback. Each one of us has evolved as a writer and the Ubud Writers’ Group can take some credit for this. We are a group that inspires writers and writing. Writers’ Groups are worth seeking out. I doubt that any two operate in the same way, but they are made up of like-minded people who love to read and write. Meetings are held every second Thursday from 10am to noon followed by lunch at Bayu's Kitchen in Penestanan, Ubud, Bali. We bring along writing to share with the group. We hand out copies and read out work. It is discussed after the reading, and later people take it home for extensive editing. Edited work from previous meetings is handed back at this meeting. Members share information related to reading and writing. They may pass on details of a book that particularly appeals, or a web site that tells about self-publishing, or a publisher that takes unsolicited manuscripts. Is the group for expats only or a mix of locals and expats? Our group is totally English speaking expats. Indonesians have never asked to join. We have asked some to become members, but they have chosen not to. In our last group book, we featured an emerging Indonesian photographer. What are your most cherished achievements and milestones to date? We have self-published two collections; Bali with a Twist, in 2010, and Life's Journeys, in 2012. We are currently working on a new one called Celebrating Bali. It will come out in 2015. People can email me, or ring me, or email or ring one of our members, and ask to join. We readily accept new members. If you would like more information about the Ubud Writers’ Group, please contact stevecastley124@gmail.com, phone me on 081 337 541 445, or drop in and see me at Bayu’s Kitchen, Penestanan, Ubud. What are the future goals and directions of the Ubud Writers Group? We intend to continue operations as usual. Sometimes we have guest speakers and we would like to get more of these. Can you describe the vibe of the group? We are a happy, friendly, supportive group that is encourages the writing development of all of our members. All of us are friends outside the group as well, even though we did not know each other before meeting up at the Ubud Writers Group. Please vote in the poll to find Asian Books Blog's Book of the Lunar Year. See here for details. Currently, two titles are tied in the lead, Bamboo Heart, and A Madras Miasma. Likewise, two titles are currently tied for second: Capital, and The Book of Sins.